The history of the network underlying the Internet and its development at ARPA; terminology of the Internet; the rise of the World Wide Web; the web as a business; computing other than the web in the 1990s and 2000s. Readings: Computer, Chapter 12; Tim Berners-Lee et. 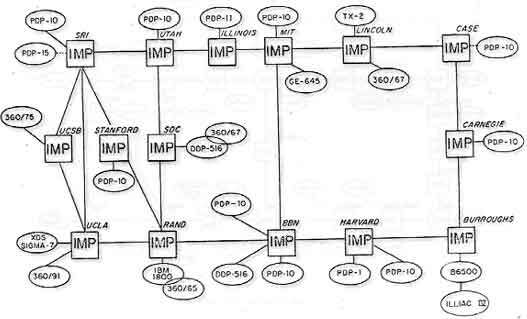 al., "The World Wide Web"
Packet switching: "packets"—data that usually make up only a fragment of a whole message—are routed independently between nodes. The Internet has no central computers where "the data is stored"
ALL web and Internet traffic uses this protocol, and traffic that uses this protocol is what defines "being on the Internet" or "being on the web"
Includes a Domain (the part following the second period, e.g. .com); the Domain Name (the Domain plus the part before the second period, e.g. amazon.com); and sometimes the server name (the Domain Name plus whatever comes before the Domain Name, e.g., www.amazon.com), and also a document name, which can be omitted, in which case it defaults to "index.html." In 1995, US Government through the National Science Foundation changed laws, allowing commerce to take place, and the web and its impact on society changed dramatically; the web was "privatized"
What do you think the web might have been like if it had never been privatized? Is the Internet actually a good system for surviving a catastrophic attack? This is a good question to research on the web. Do you think the Internet or the web would have come into being without the aid of the Defense Department? If so, in what form might it have emerged? What aspects of human life might the Internet or the web "amputate," the term used by Marshall McLuhan in "The Medium Is the Message"?